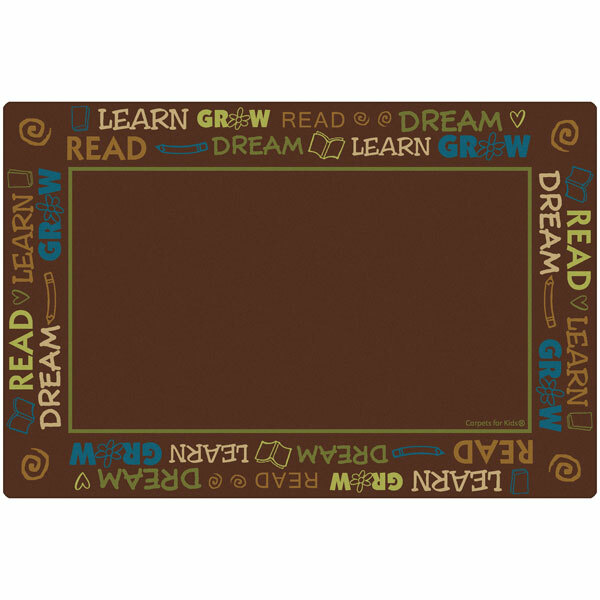 The Read to Dream Library Rug has an earth tone border of reading-themed words and images on a brown background. This classroom rug will appeal to children in both elementary and middle school. WIth its KIDply� backing system, antimicrobial treatment and Carpet Guard stain protection, it will look like new for years to come. The Read to Dream Library Rug is backed by Carpets for Kids' lifetime warranty. Made in the U.S.A.
Carpets for Kids' Read to Dream Library Rug has an earth tone border of reading-themed words and images on a brown background. This classroom rug will appeal to children in both elementary and middle school. WIth its KIDply® backing system, antimicrobial treatment and Carpet Guard stain protection, it will look like new for years to come. The Read to Dream Library Rug is made in the U.S.A. and backed by a lifetime warranty. Choose from three sizes. At SCHOOLSin, we work hard to deliver great customer service. So give us a call at (877) 839- 3330 for assistance with your order.